We recommend you to go through the article on Campaign Analytics prior to this to gain a better understanding. Conversion goals help you to track your business metrics in relation to a campaign and help you measure how your campaign helped you achieve your business metrics. With MoEngage Push campaigns, you can track multiple conversion goals i.e. up-to 5 conversion goals. 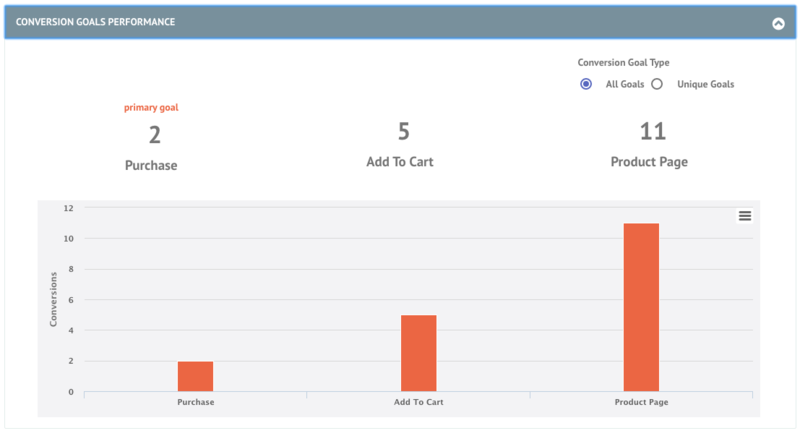 With multiple conversion goals, you can track more than one business metrics and can visualize a funnel for your user actions. We have tried elxplaining the concept with an example. You can view this funnel once campaign is created and sent under Conversion Goals Performance on Campaign Analytics page. All Goals will show you all the conversion events while Unique Goals will show you conversions unique across user per campaign instance. Check this article to understand the difference between conversion events and conversions.